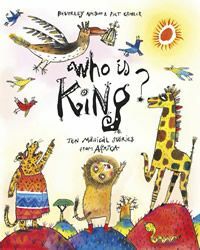 Find out what happens to Lion when he challenges Elephant and discovers who is the real king of the savannah; laugh along with Tortoise as he bewitches the animals in Tiger's work-party with his irresistible music; find out why Hippo has no hair, how Elephant got his trunk, and why Cockerel crows. Then read about the woman who had a mouse-child! The stories are drawn from the rich folklore of Ethiopia, Ghana, Nigeria, Tanzania, Malawi, Lesotho, Zimbabwe and South Africa.